ODESSA, Ukraine -- When Andrei Krasilnikov hugged his wife good-bye last week and climbed onto a bus to take him back to the frontline in eastern Ukraine, his motive was typical of those fighting for Kiev -- to defend his family and future from what he perceives as Russian aggression. 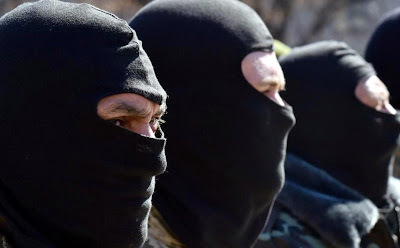 Fighters of the Ukrainian volunteer battalion 'Donbass' attend a farewell ceremony in Kiev on March 17, 2015 before departing to eastern Ukraine on operations against pro-Russia militants. What sets him apart from his brothers-in-arms is his Russian citizenship. Krasilnikov, 48, is one of several Russians fighting as a volunteer against the pro-Moscow insurgency in the Donetsk and Lugansk regions. Like many Ukrainians he views the conflict as "a war by Russia against Ukraine" rather than a home-grown uprising. "The thing is, we are not fighting against Russians but against (President Vladimir) Putin's army," he said. "Not everyone in Russia supports Putin and his regime... a regime that is militarised, a police regime that can do whatever it wants with its own people." Though he has lived in Ukraine's southern Russian-speaking city of Odessa for a decade and has a Ukrainian wife and son, the Moscow-born Krasilnikov still holds a Russian passport. His friends in the pro-Kiev Aydar battalion view that "completely normally," he said, recounting taking heavy artillery fire with them in the Lugansk region in February, shortly before the latest ceasefire came into effect. "They shook my hand and said that I was a true Russian who understands everything." Back in the land of his birth, however, he had to break off ties with friends who started calling him a "fascist" after he took part in protests last year that ousted the Kremlin-backed leader Viktor Yanukovych. "They got it in their heads that Ukraine has a fascist regime and a junta," Krasilnikov said, using the terms employed by Russian state media to describe the country's new pro-Western government. Despite risking his life for Ukraine, the irony for Krasilnikov and other Russians opposing Putin here is that they still face suspicion from Kiev even though going back home may mean time in a Russian jail. Krasilnikov has had an application to renew his residency permit rejected by suspicious authorities and he says one reason for staying at the frontline is that immigration officials won't go looking for him there. "I cannot go outside Ukraine to Russia because I am more than sure that I will get arrested there," he said in an interview in Odessa a few hours before heading to the front. The sense of limbo was echoed by other Russians interviewed by AFP. Despite opposing Putin, they said that they are often likely to be stonewalled by authorities in Ukraine, especially low-level officials who are often pro-Moscow. Pyotr Lyubchenkov, an opposition activist from Russia's Krasnodar, had his request for political asylum last year denied in Odessa. The file that the immigration services had on him "even used descriptions from pro-Kremlin websites," he told AFP. Lyubchenkov, a 40-year-old psychologist, opposed the annexation of Crimea last year and is wanted in Russia after trying to organise an opposition rally. He is the subject of a probe that has already seen two people arrested. "I hope I don't get deported," he said. "It was a simple idea, coming here," Lyubchenkov said, describing how he had expected his support for Kiev's pro-Western ideas would meet a sympathetic ear. He joined up with pro-Western protesters in Odessa and helps the local group opposing separatist activity in the Russian-speaking city. These days he is even putting together free Ukrainian language lessons in a local library. But despite his expectations, "the reality turned out very different," he lamented: even Russians who support Ukraine's cause -- in battle or not -- are sidelined by its rank and file bureaucracy. One of the few exceptions is Ilya Bogdanov, a far-right Russian nationalist who has been fighting in pro-Kiev battalions since last summer. "I am fighting against Putin's regime, for a free, white Ukraine that is pro-European," he said by phone from the village of Pisky near the Donetsk airport -- one area which continues to take fire despite the month-old truce. The fighter in the extreme Ukrainian nationalist Right Sector group chronicles the conflict on his Facebook page and regularly gets into arguments with Russians fighting on the opposite side on social media. "It's a lot of Russians, practically only Russians" fighting on the separatist side, he said, having made a complete break from his past in Russia's far-eastern city of Vladivostok, including his pro-Putin mother. A month ago, he received Ukrainian citizenship -- after a lengthy process that was resolved only through the personal intervention of Ukraine's top leadership. "It was extremely difficult, at every level they tried to block it," he said. "I am citizen of Ukraine now, I fight for my land," he says with a laugh. "Everything I have is right here."